(Dana Point, California) — A previously unrecorded 1943-S Lincoln cent, erroneously struck on a bronze planchet and found in circulation by a teenaged collector over a half century ago, has been acquired by Rare Coin Wholesalers of Dana Point, California. The discovery coin now is certified as AU-53 by Numismatic Guaranty Corporation. "The coin was found in 1944 by Kenneth S. Wing Jr. of Long Beach, California who was assembling a set of Lincoln cents at the time," said Steven L. Contursi, President of Rare Coin Wholesalers (www.RCW1.com). Wing became a prominent Southern California architect who co-designed the Long Beach Arena in the late 1950s. He passed away in 1996. "When his heirs recently asked me to examine the coin, I doubted it was genuine. But then I got a magnet and was surprised when the coin did not stick to it. So, on behalf of Mr. Wing’s heirs I submitted it for certification," Contursi explained. "It’s delightful and amazing there are still examples of great numismatic rarities to be ‘discovered’ and reported to the hobby." Contursi plans to publicly display the 1943-S bronze cent at various coin shows including the upcoming American Numismatic Association World’s Fair of Money® in Baltimore and the Long Beach Coin, Stamp & Collectibles Expo in September. 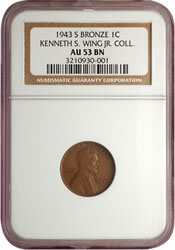 To honor the memory of the coin’s finder and the family that owned it for 64 years, he requested that NGC include the notation on the encapsulation insert label, "Kenneth S. Wing Jr. Coll." "My Father was an avid penny collector. His parents would get him rolls of pennies from the bank every few weeks, and he’d search through them. He found the 1943 (bronze) penny in Long Beach in 1944 when he was 14 years old, but I’m not sure if it was from pocket change or from a roll (of circulating cents) from the bank. He took it to a local dealer who offered him $500 for it, but my Father said it wasn’t for sale." The coin was in a simple Capitol Plastics cent holder in a bank safe deposit box with the rest of Wing’s collection, found there after he died in 1996. Paul Wing says his father didn’t talk much about the coin over the years, and he didn’t actually see it until after his father passed away. "My Father pulled most of his collection from circulation, and purchased a few coins he could not find. He found a 1922 ‘no D’ cent in change, but had to eventually buy a 1909-S V.D.B.," explained the son. Those coins remain in the collection inherited by Wing’s family. "The 1943 bronze Lincoln cent really transcends a wrong planchet error. 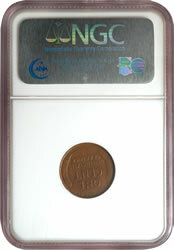 Today, it’s widely considered to be a classic twentieth century rarity, more kin to a transitional type, and now is collected as part of the regular series by devoted Lincoln cent enthusiasts," commented Dave Camire, President of Numismatic Conservation Services and a mint error consultant to NGC. "This piece is particularly important because it’s from San Francisco, a scarcer mint for the issue compared to better-known Philadelphia Mint specimens. This coin is also a recent discovery to the numismatic community," Camire stated. Common zinc-coated steel cents will stick to a magnet but the handful of known 1943-dated Lincoln cents mistakenly struck in bronze (in this case, an alloy of 95 percent copper and 5 percent tin and zinc) will not. The zinc-coated steel metallic composition was used in 1943 to conserve copper that was needed for U.S. efforts in World War II. "When I purchased the coin I also received Mr. Wing’s interesting file of correspondence dating back to 1946 as he tried to verify the coin’s authenticity. Some of the responses he received from the Mint, the Smithsonian Institution and well-known dealer of the era, Abe Kosoff, may seem a little humorous today." "In reference to your letter of August 11th, there were no copper cents struck during the calendar year 1943 at any of the coinage Mints. Only the zinc coated steel cent was struck during that year." Today, though, the hobby is aware of more than a dozen 1943 bronze cents with at least one example known from each of the Mints producing Lincoln cents that year: Philadelphia, Denver and San Francisco. Contursi acquired the coin and correspondence for $72,500. The letters from and to Wing indicate he tried for decades to get information about his historic, off-metal cent. "In 1948, on a trip to San Francisco, it (the coin) was shown to the Director of the mint and his ‘private’ opinion was that of authenticity. In 1957, my Father was in Washington, DC, (sic) he attempted to have the Treasury Department examine it, however, they refused and referred him to the Smithsonian Institution." "It would be of prime importance to determine, beyond any doubt, that your 1943-S Cent is a genuine one. This would require a number of tests and the outlay of considerable cash." "The authenticity of this piece is in my opinion beyond doubt. In fact, as you certainly recall, Mr. Mendel L. Peterson, Acting Head Curator of the Department of History, fully concurred in this opinion." 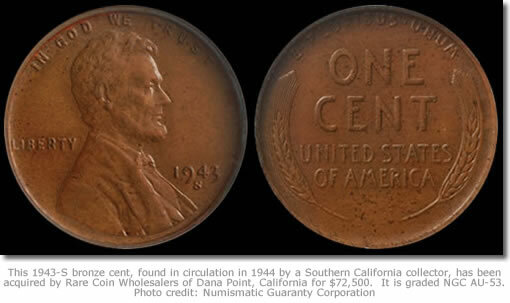 Contursi said his recently-acquired 1943 bronze Lincoln cent is quite special for him. "Of all the million dollar coins I’ve bought or sold – from Brasher Doubloons to the King of Siam set – this is the first 1943 ‘copper penny’ I’ve ever owned!" For additional information, contact Rare Coin Wholesalers, P.O. Box 3873, Dana Point, CA 92629. Phone: (800) 347-3250. E-mail: RCWcoins@rcw1.com. Online: www.rcw1.com. Rare Coin Wholesalers is located in Dana Point, California and specializes in United States Rare Coins. Rare Coin Wholesalers have bought and sold over a billion dollars in rare coins, and owned or participated in the purchase or sale of most of the “100 Greatest U.S. Coins.” Rare Coin Wholesalers is are major auction participants and maintain important relationships with America’s largest auction houses. In addition to our inventory of fine rarities, Steve Contursi, President of Rare Coin Wholesalers, is proud to be the current custodian of some of our country’s national treasures. These include the coin believed to be the first United States Silver Dollar struck, the Neil/Carter/Contursi 1794 Dollar. In January of 2005 Mr. Contursi acquired the Brasher Doubloon, EB on Breast, the first gold coin minted for the young United States. On November 1, 2005, Mr. Contursi acquired America’s greatest proof set, The King of Siam. Rare Coin Wholesalers has expertise, financial resources, and knowledge of the marketplace to sell, appraise, purchase, and trade rare coins and precious metals. I wonder if some one who read this may offer suggestion and assistance. The coin featured above is likely a one of a kind coin as no others have been found to date. It would likely fetch $500,000.00 at a great auction. That is, of course, if Steve Contursi would ever part with such a rarity. I can relate to his passion for such unique coins. I am sorry to say, however, that a 1957 is an extremely common date which is still possible to find in your pocket change. Although it is a fun thing to find a 60 year old penny, it is only worth a few cents. I just found a 1966 40% silver Kennedy half dollar. On the reverse the letters in half dollar are doubled. I had it in a holder for some time and just checked it out a few minutes ago. It appears to be in au 50, what is it worth and how many have been reported? I have also a 79s penny that has an extra dot on it. I recently found a 1929-S INVERTED (s). to date I know that only one has been found, a 1946-S Inverted. (S) Who should I be contacting about this. I acually have one of these pennys. A 1943 penny. I was wondering the acual value of this coin? There is a problem with this story and it involves magnets. If this penny was copper a magnet would not stick to it either. Only the Steel war pennies would stick to a magnet and they were steel in color (or rusted). Do you still have this coin? If so would you consider selling? I was looking through my coins that I had just thrown in my jewelry book and found 6-1943 pennies that does not stick to a magnet. Who do I talk to to see if they are rare. My friend is holding onto a 1943 D Lincoln penny and is afraid it is not worth anything. It is copper or bronze and It has the long 3. How do I convince him to have it looked at and where. How do I know if a 1943 is copper or not? I have a 1943 steel penny with a number 5 right next to the E after the word one on the reverse side has anyone ever seen something like this and if it’s valuable or not?